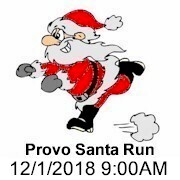 The Utah Santa Run is the Jolliest 5K in Utah requiring all runners to run dressed as Santa Claus. These races are in Ogden, Provo and West Jordan at Gardner Village. All races include a full Santa Claus costume (Hat, Beard, Jacket, Pants, and Belt) to keep after the race. These races are so funny and fun to run. These races start with a Santa Warm Up exercise, then you run on one of the three awesome themed courses. These races have milk and cookie aid stations as well as volunteers that dress as elves to support the course. Christmas music plays overhead and they each are followed by fun holiday city Christmas Magic. Kids 8 and under run for free with paid adult!